Family lawyers from across England and Wales attended Jordan Publishing's inaugural Family Law Awards ceremony on 18 October at the Hilton Park Lane in London. ALC member Vanessa Priddis from Michelmores Solicitors in Exeter won the Family Law Solicitor of the Year and Teertha Gupta from 4 Paper Buildings, also an ALC member, Barrister of the Year. 4 Paper Buildings won Family Law Chambers of the Year. 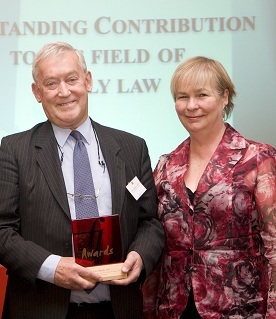 Congratulations also to District Judge Nick Crichton, an Honorary member and long-time supporter of the ALC, who was given a standing ovation by the audience as he was presentation by Martha Cover, ALC Co-Chair with the Outstanding Contribution to the Field of Family Law award.